Miyamoto's latest pet-project, Steel Diver, released to mixed critical reception; some found its slow-paced, strategic gameplay fun and refreshing, while others found it...well, boring. 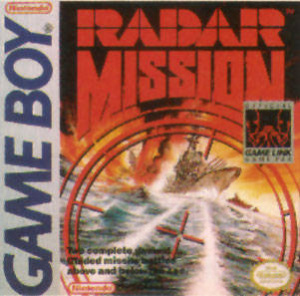 Suffice it to say that if you fall into the latter camp, you likely won't get a whole lot of enjoyment out of Nintendo's 1990 Gameboy title, Radar Mission, a spiritual precursor to Steel Diver in some senses, as it takes a similarly slow-paced approach to submarine combat. If you dug the unorthodox 3DS launch title, though, or if you happen to be a big fan of Battleship, Radar Mission is a surprisingly fun little game that benefits from the 3DS' Virtual Console features. There are two game modes here; Game A is essentially a more cinematic take on Battleship, albeit with a few twists and additions, like a “Lucky Star” power-up that increases your chance of a direct hit. If you've played the board game, you should know exactly what to expect: you arrange a fleet of ships on a large grid as strategically as possible, and your opponent does the same. 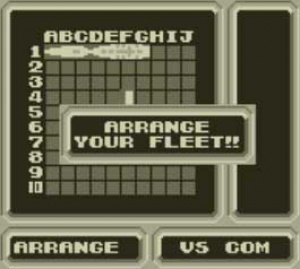 You each take turns firing torpedoes, trying to take out each other's fleet by selecting a spot on the grid where you think their ship might be. It's an old concept, but the game's charming presentation and excellent soundtrack make it much more addicting than it probably has a right to be. Game B is the more “action-y” of the two, and its easy to spot the influence that it had on Steel Diver, as it plays almost exactly like the recent title's Periscope Attack mode. 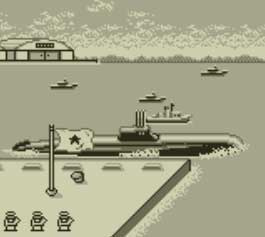 You take a first-person view of a submarine and attempt to fire torpedoes at enemy ships, using a combination of surfacing and diving techniques to evade enemy fire. When you dive beneath the surface, you'll be able to see a radar showing the positions of hostile ships as well as your own fleet that you're trying to defend. 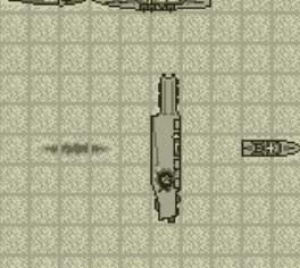 Now, one of the cooler aspects of Diver's periscope game is that it uses the system's gyroscope for quick maneuverability; it almost seemed gimmicky at first, but going back to Radar Mission's Game B immediately reveals its advantages, because controlling a periscope with a D-Pad can apparently be really cumbersome. It can sometimes take up to 20 seconds to scroll to the part of the map that you need to, which wouldn't necessarily be a problem if you had any opportunity to defend your fleet in the meantime. But of course you don't; so although Game B can be fast-paced fun, it can also be pretty darn frustrating on the harder difficulties. Getting a Game Over in either of the two game modes will take you right back to the title screen with all your progress done away with, so not surprisingly, Radar Mission plays much better on the 3DS, since you can create a Restore Point (similar to the Wii Virtual Console's Suspend Data) at any point during the game. Unfortunately, though, this port does make a major sacrifice in that it renders the original title's multiplayer mode completely useless. Talking about Radar Mission in a recent Iwata Asks interview (about Steel Diver, of course) Miyamoto said, “when you play with another person, it becomes much more fun; so much so that you would never want to stop. But being so plain, it never really took off.” So it's a shame that Nintendo didn't make the effort to implement Download Play, as the creator himself admits that it's not as much fun by yourself. Radar Mission is still a fun little piece of gaming history, and its charming presentation and excellent soundtrack have allowed it to age far better than it probably would have in the hands of anyone other than Nintendo. For just $2.99, this is a good get for anyone interested in the inspiration for Nintendo's aquatic IP, or gamers looking for some simple-yet-strategic gameplay with a retro kick. I love this game. Still have the original cardridge so if it hits Europe, I'll probably skip it. Especially since the multiplayer is cut out. Come on Nintendo, you can implement that. I don't know why Nintendo doesn't go the extra mile and add at least local wireless play, even if both people need to dl it. This is especially puzzling considering the TLC given to the 3D Excitebike update. I think wireless multiplayer can be implemented for Gameboy games via the Virtual Console menu by including to option to connect two or more 3DS systems to one another for the duration of the game (and of course, suspended saving would be disabled whenever multiple players are connected to one another). Make it happen, Nintendo. I wouldn't be surprised if a future system update includes this feature. Hmm, I'll still probably get it. One of the few GB games I still had as of early this year when I got rid of my stuff due to changes going on this year at home. Battleship is always fun and the stars allowing for a horizontal I beam shot or an X shaped blast was cool for sure. I really dug the torpedo alley game and I didn't find it all that hard to control. Also not mentioned is that you can earn money bags and they allow you to power up to a double screw prop(fast turning), double torpedo, and other stuff which really helped out. I think this game is worth it just for having the best computerized version of Battleship I've ever seen. I haven't even tried the other game yet. @sillygostly - This is Nintendo we are talking about. It probably will not happen. So is it like the board game Battleship? Hahaha, Nintendo quoted this on their description. Seems good. You can get this using a Club Nintendo account, so I'll probably get it. Looks fun!